ITW Safety specializes in the design, manufacture and assembly of injection moulding plastic components and automated assembly. Primary product lines for Occupant Safety Systems include components for Retractors, Buckles and Airbag components. 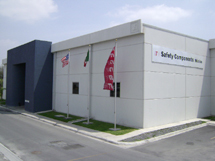 ITW Safety consists of three major facilities in Germany, Mexico and China. All units are ISO TS 16949 and ISO 14001 certified and operate under strict quality standards. ITW Safety is the synergy of 3 global strategically located production sites. Shanghai ITW Plastic & Metal Co., Ltd.
ITW Safety is worldwide supported by 7 sales representatives, located in Europe, North America, Japan, China and India. We offer our customers a world- wide presence under one lead and name.